1 Marinate the longganisa: In a large bowl, mix garlic, chili flakes, vinegar, and soy sauce with longganisa. Mix well and marinate overnight. 2 Make the aligue rice: In a large pan, saute garlic in olive oil over medium-low heat until softened. Add crab fat, stirring constantly until the mixture loosens. Add rice and toss to coat, until crab fat is evenly distributed. Season with salt to taste. Keep warm. 3 Heat oil in a frying pan. Fry marinated longganisa until toasted and golden brown. 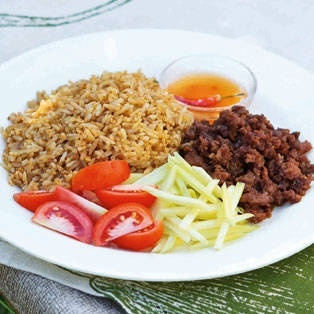 Serve with aligue rice, sliced green mangoes, fresh tomato wedges, and sukang Iloco.